» home » magazine » 2009 » january 2009 » is formability a useful term? Formability is a simple word that means the ability to form (or deform) a material. While mainly applied to manufacturing metallic items, artists define formability as the ability to shape their medium before it hardens and is no longer workable. Many industries and hobbies liberally use the word formability. Unfortunately, the word formability is simple but the meaning is complex when applied to metalforming. • Formability decreases as strength increases. • If the part tears when made from aluminum-killed draw-quality steel, then substitute vacuum-degassed interstitial-free steel because it has more formability. • Work hardening makes the material harder and less formable. • Coil number 15 has more formability than coil number 27. From these sentences, one might think there is a universal formability scale, where each coil or lift of blanks has a single numerical formability rating. The existence of such a rating system would make life easier for material producers, designers and users. Unfortunately, such a magic number exists only in dreams. Fig. 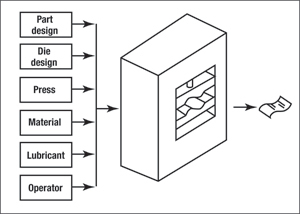 1—Each of the six general categories of metalforming input variables contains about 10 sub-level inputs. The output (part) is an interaction of all input variables. Each coil has a special chemistry consisting of a base metal with varying amounts of alloying elements plus other elements to create desired properties for specific applications. The coil may receive different processing, such as vacuum degassing, hot rolling, cold rolling, annealing, coating, temper rolling and other processes to further develop a product that meets customer needs. Formability of each coil can be different from other coils. Unfortunately, the four sentences above present formability simply as a characteristic of the material. Instead, formability is the result of a complex and interactive system of inputs. Fig. 1 shows six major input groups, each with many sub-variables. The sheetmetal is only one input that determines formability. The other five inputs to the forming system usually make a greater contribution to the formability. For example, a common problem occurs when a successful forming operation transfers from the home press line to a backup press line. The die, sheetmetal, lubricant and even operator can be the same, but the part now fails. The different press characteristics have changed the formability of the entire system. Making the problem even more complex, different properties of the sheetmetal are important for different forming modes. For stretchability, the strain hardening of the material is extremely important. The greater the strain-hardening capacity of the sheetmetal (as measured by the work hardening exponent or n-value), the more it can be stretched in one or both surface directions. The higher the n-value, the greater the maximum allowable stretch at failure as defined by the forming limit curve and the reduction in localized strain gradients. Fig. 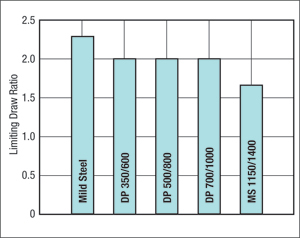 2 shows a steady reduction in stretchability as the yield strength increases from 25-ksi (175 MPa) mild steel to 150-ksi (1050 MPa) martensitic steel. Fig. 2—Steel stretchability as measured by dome height decreases with increasing yield strengths. Courtesy of IISI AHSS Application Guidelines–Version 3. Fig. 3—Same steels shown in Fig. 2 tested in cylindrical cup drawing. 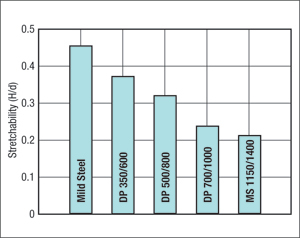 The DP steels have a constant LDR of 2.0 over a doubling of the yield strength. Courtesy of IISI AHSS Application Guidelines–Version 3. Immediately, one is tempted to believe that the first statement above is correct—that formability decreases with increasing strength. However, the correct statement is that stretchability decreases with increasing strength. Stretchability is only one mode of forming and formability. Forming a cylindrical cup is a drawing (radial drawing, deep drawing) mode of deformation. Unlike stretching which is a tensile mode of deformation, cup drawing is a compressive mode. Sheetmetal fails in tension, not compression. Fig. 3 shows the change in the Limiting Drawing Ratio (LDR)—maximum blank diameter without failure divided by punch diameter—for the five steels. All three dual phase (DP) steels have a constant 2.0 LDR. The mild steel has a 15-percent increase over the 2.0 LDR, while the martensitic steel (MS) has 15-percent decrease below the 2.0 LDR. Cup drawing is relatively insensitive to material strength over the large range of yield strengths shown in Fig. 3. An interesting example of deep draw formability is the early two-piece steel beer can. The first press contains a die to create a cup. In the second press the die combines redraw, three ironing stages and bottom dome forming in one stroke. The steel grade for the beer cans is DR-9. After final annealing, an additional cold reduction reduces the thickness of the DR-9 grade by another 35 percent. This makes the steel blank thinner and full hard. The blank would have very little stretchability. Several studies show a relationship between three-point air bending and total elongation. Therefore, the same sheetmetal blank (with one set of properties) has different formability depending on the forming mode. Within each forming mode, a change in part design, die design, lubrication, press and even operator will further change the formability of that blank.